11 Oct 2018 – Today, WikiLeaks publishes a “Highly Confidential” internal document from the cloud computing provider Amazon. It lists the addresses and some operational details of over one hundred data centers spread across fifteen cities in nine countries. To accompany this document, WikiLeaks also created a map showing where Amazon’s data centers are located. Amazon is the leading cloud provider for the United States intelligence community. 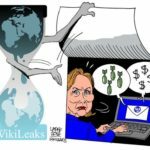 Today, 9 Nov 2017, WikiLeaks publishes the source code and development logs to Hive, a major component of the CIA infrastructure to control its malware. Vault 8: Source code and analysis for CIA software projects including those described in the Vault7 series.This publication will enable investigative journalists, forensic experts and the general public to better identify and understand covert CIA infrastructure components. Today, September 19th 2017, WikiLeaks starts publishing the series “Spy Files Russia” with documents from the Russian company Петер-Сервис (PETER-SERVICE). This release includes 209 documents (34 base documents in different versions) dated between 2007 and 2015. Today, September 7th 2017, WikiLeaks publishes four secret documents from the Protego project of the CIA, along with 37 related documents. Protego is not the “usual” malware development project like all previous publications by WikiLeaks in the Vault7 series. Today, August 31st 2017, WikiLeaks publishes documents from the Angelfire project of the CIA. Like previously published CIA projects (Grasshopper and AfterMidnight) in the Vault7 series, it is a persistent framework that can load and execute custom implants on target computers running the Microsoft Windows operating system (XP or Win7). Today, August 24th 2017, WikiLeaks publishes secret documents from the ExpressLane project of the CIA that show one of the cyber operations it conducts against liaison services — which includes among many others the NSA, the Department of Homeland Security and the FBI. Today, August 10th 2017, WikiLeaks publishes the User Guide for the CoachPotato project of the CIA. CouchPotato is a remote tool for collection against RTSP/H.264 video streams. Today, August 3rd 2017 WikiLeaks publishes documents from the Dumbo project of the CIA. Dumbo is a capability to suspend processes utilizing webcams and corrupt any video recordings that could compromise a PAG-Physical Access Group deployment. Today, July 19th 2017, WikiLeaks publishes documents from the CIA contractor Raytheon Blackbird Technologies for the “UMBRAGE Component Library” project. The documents were submitted to the CIA between November 21st 2014 (just two weeks after Raytheon acquired Blackbird Technologies to build a Cyber Powerhouse) and September, 11th 2015. Today, July 13th 2017, WikiLeaks publishes documents from the Highrise project of the CIA. HighRise is an Android application designed for mobile devices running Android 4.0 to 4.3. It provides a redirector function for SMS messaging that could be used by a number of IOC tools that use SMS messages for communication between implants and listening posts. Today, June 28th 2017, WikiLeaks publishes documents from the ELSA project of the CIA. ELSA is a geo-location malware for WiFi-enabled devices like laptops running the Micorosoft Windows operating system. Once persistently installed on a target machine using separate CIA exploits, the malware scans visible WiFi access points and records the ESS identifier, MAC address and signal strength at regular intervals. Today, June 29th 2017, WikiLeaks publishes documents from the OutlawCountry project of the CIA that targets computers running the Linux operating system. It allows for the redirection of all outbound network traffic on the target computer to CIA controlled machines for ex- and infiltration purposes. The malware consists of a kernel module that creates a hidden netfilter table on a Linux target. Today, June 22nd 2017, WikiLeaks publishes documents from the Brutal Kangaroo project of the CIA. The documents describe how a CIA operation can infiltrate a closed network (or a single air-gapped computer) within an organization or enterprise without direct access. Today, June 15th 2017, WikiLeaks publishes documents from the CherryBlossom project of the CIA that was developed and implemented with the help of the US nonprofit Stanford Research Institute (SRI International). CherryBlossom provides a means of monitoring the Internet activity of and performing software exploits on Targets of interest. In particular, CherryBlossom is focused on compromising wireless networking devices, such as wireless routers and access points (APs), to achieve these goals. Today, June 1st 2017, WikiLeaks publishes documents from the “Pandemic” project of the CIA, a persistent implant for Microsoft Windows machines that share files (programs) with remote users in a local network. “Pandemic” targets remote users by replacing application code on-the-fly with a trojaned version if the program is retrieved from the infected machine. Today, May 12th 2017, WikiLeaks publishes “AfterMidnight” and “Assassin”, two CIA malware frameworks for the Microsoft Windows platform. “AfterMidnight” allows operators to dynamically load and execute malware payloads on a target machine. “Assassin” is a similar kind of malware; it is an automated implant that provides a simple collection platform on remote computers. Today, May 5th 2017, WikiLeaks publishes “Archimedes”, a tool used by the CIA to attack a computer inside a Local Area Network (LAN), usually used in offices. It allows the re-directing of traffic from the target computer inside the LAN through a computer infected with this malware and controlled by the CIA. Today, April 28 2017, WikiLeaks publishes the documentation and source code for CIA’s “Scribbles” project, a document-watermarking preprocessing system to embed “Web beacon”-style tags into documents that are likely to be copied by Insiders, Whistleblowers, Journalists or others. Today, April 14th 2017, WikiLeaks publishes six documents from the CIA’s HIVE project created by its “Embedded Development Branch.” HIVE is a back-end infrastructure malware with a public-facing HTTPS interface which is used by CIA implants to transfer exfiltrated information from target machines to the CIA and to receive commands from its operators to execute specific tasks on the targets. Today, March 23rd 2017, WikiLeaks releases Vault 7 “Dark Matter”, which contains documentation for several CIA projects that infect Apple Mac firmware (meaning the infection persists even if the operating system is re-installed) developed by the CIA’s Embedded Development Branch. Today, Tuesday 7 March 2017, WikiLeaks begins its new series of leaks on the U.S. Central Intelligence Agency. Code-named “Vault 7” by WikiLeaks, it is the largest ever publication of confidential documents on the agency. The first full part of the series, “Year Zero”, comprises 8,761 documents and files from an isolated, high-security network situated inside the CIA’s Center for Cyber Intelligence in Langley, Virgina. 16 February, 2017 – All major French political parties were targeted for infiltration by the CIA’s human (“HUMINT”) and electronic (“SIGINT”) spies in the seven months leading up to France’s 2012 presidential election. The revelations are contained within three CIA tasking orders published today by WikiLeaks as context for its forth coming CIA Vault 7 series. Today, Thursday, December 3, WikiLeaks releases new secret documents from the huge Trade in Services Agreement (TiSA) which is being negotiated by the US, EU and 22 other countries that account for 2/3rds of global GDP. WikiLeaks will continue publishing, as it has since its foundation, full archives of suppressed documents in strategic global partnerships. The 2.0 public-facing submission system is an important new method in our arsenal for recovering subjugated history. Today, 15 January 2014, WikiLeaks released the secret draft text for the entire TPP (Trans-Pacific Partnership) Environment Chapter and the corresponding Chairs’ Report. 11 Oct 2013 – This week Edward Snowden received the Integrity Award from the Sam Adams Associates for Integrity in Intelligence. These videos from the award ceremony are the first of Mr Snowden after being granted asylum in Russia. September 23, 2013 – The following post is a summary of events from the “Athens Affair”, which was widely reported on in 2007. In particular, an investigation was re-opened and concluded in 2011, of which we found almost no reference in English media. The article quotes a large number of cables which suggest that, for a number of years, the US government has been very interested in helping US companies to win contracts to make investments in Brazil, against Petrobras. On June 10, 2013, US Iraq war veteran Daniel Somers wrote a final letter to his wife and family before taking his own life. He said he was forced to participate in horrific crimes against humanity and cover them up. Soldiers of conscience are coming forward against wars. They strive to inform the public that what has transpired during these wars should be considered a crime. Thu, Nov 29th , Bradley Manning testified for the first time since his arrest two and a half years ago in Baghdad. Today also marks the two-year anniversary of the first front pages around the world from Cablegate, an archive of 251,287 U.S. State Department diplomatic cables — messages sent between the State Department and its embassies, consulates and diplomatic missions around the world. The United States Government has instigated a grand jury investigation against Julian Assange and other “founders or managers” of WikiLeaks. Australian diplomats have described this investigation as being of “unprecedented scale and nature”. There is irrefutable evidence in the public record of subpoenas being issued and witnesses being compelled to testify against Mr. Assange. 18 November 2010. Why Our Editor-in-Chief Is Busy and Needs to Be Defended. WikiLeaks, a publisher of last resort.